*Fans of smooth jazz in southeast PENNSYLVANIA and southern NEW JERSEY are about to get their format back. Greater Media, which is acquiring WTHK (97.5 Burlington NJ) in a trade with Nassau, announced last week that it will flip the station from classic rock ("The Hawk") to smooth jazz on November 15, bringing back the format and the WJJZ calls that disappeared from the market when Clear Channel flipped the previous WJJZ (106.1 Philadelphia) to rhythmic AC "Philly's 106.1" as WISX in August. The new WJJZ will launch from the longtime 97.5 transmitter site in Trenton, since Greater Media has not yet finished (or, as far as we know, even started) construction of the station's new transmitter facility at the Wyndmoor tower site just outside Philadelphia. Assuming nothing changes between now and November - it's always at least slightly risky, after all, to announce a format flip this far in advance - the flip to smooth jazz will broaden the demographic range of Greater's Philadelphia cluster, which currently leans heavily male and rock-oriented with sports WPEN (950), rock WMMR (93.3), adult hits WBEN-FM (95.7) and classic rock WMGK (102.9). Greater Media says it will have the new signal from Wyndmoor on the air by January 2007...as always, stay tuned! *In other Philadelphia news, Janita Jones is out in middays at Beasley's WRDW (Wired 96.5), with Casey moving from the morning show to replace her. Over at WXPN (88.5)'s "YRockon XPN.org" service, former WPLY morning host Marilyn Russell comes on board for Friday afternoons. In Wilkes-Barre/Scranton, WBSX (97.9 Hazleton) music director/midday jock James McKay moves up to the PD slot vacated by Chris Lloyd when he moved to WBAB on Long Island. McKay will shift to the afternoon air chair, with Zoey moving from nights to middays and weekender Cayden taking over nights. *Some sad news out of eastern MASSACHUSETTS this week - WBZ (1030 Boston) nighttime talk host Paul Sullivan isn't out of the woods yet as he continues his fight against brain cancer. Sullivan underwent two operations in 2004, but recent tests turned up more signs of cancer, so he was back at Mass General last week for a third surgery. The good news? Word is he's already recuperating, and planning to be back on the air in time for election night next month. Emerson College's WERS (88.9 Boston) is hearing the feedback from its recent schedule changes, which dropped the midday "Jazz Oasis" show, the "Gyroscope" world-music show and the late-night dance show "Revolutions." WERS moved the reggae show "Rockers" later into the evening (7-10 PM instead of 4-8 PM), filling the remainder of its daytime hours with a new AAA-ish format it calls "Music for the Independent Mind," which combines the former morning show, "Coffeehouse," with some of the world music and dance music that was heard in other parts of the day. *NEW HAMPSHIRE Public Radio went, er, "public" last week with the details of its expansion plans. The statewide network says it's outgrown its home on North Main Street in Concord, and it's looking forward to a mid-2007 move into new quarters in the former Blue Cross building. NHPR has already raised $2.6 million of the $6.5 million it's seeking - $5.5 million for the new facilities, which will include a 60-seat live performance studio and $1 million for conversion to HD Radio, enabling it to multicast three program streams around the Granite State. And speaking of budget-cutting TV news operations, we're at least slightly bemused by the "Preserve Local TV" campaign being run by Nexstar's stations around the country, including WROC/WUHF in Rochester, WUTR/WFXV in Utica, WBRE/WYOU in Scranton and WJET/WFXP in Erie. Claiming "local TV is threatened by Congress," the campaign is running frequent on-air announcements asking viewers to contact lawmakers and "save local TV." What's it really all about? Expanding TV duopoly and preserving the LMA-style arrangements under which Nexstar operates more than one signal in each of those markets - and in which it axed local news completely in Utica and cut back staff and news budgets in other markets. Across the lake in Plattsburgh, NEW YORK, we hear the sale of WWBI-LP (Channel 27) to the "Word of God Religious Fellowship" has fallen through, and the station has reverted from Daystar religion to the i (formerly PAX) programming it was carrying until 2005. The station is on the market again, and we hear a new buyer could be announced soon. In Albany, Mick Lee moves back from Washington DC (where he was briefly at "Hot 99.5" WIHT after leaving Clear Channel's WKKF), joining WFLY (92.3 Troy) to do afternoons with Christy Taylor. PD Terry O'Donnell moves into Taylor's former midday slot. At SUNY Oneonta, the construction permit for WUOW-LP (104.7) has been returned to the FCC; the school also has noncom WONY (90.9), which continues to operate. *In CANADA, Blackburn Radio's CIBU (94.5 Wingham) has been granted a relay transmitter in Bluewater, near Sarnia. The new signal will operate on 91.7 with 2.3 kW, covering an area where CIBU suffers co-channel interference from WCEN-FM (94.5 Mount Pleasant MI). Bayshore Broadcasting opposed the grant, saying it planned to use 91.7 in an application for a new signal in Goderich, Ontario, but the CRTC says it can find an alternate frequency for the Goderich station, if granted. White moved to television in 1979, working on the "I-Team" at Boston's WBZ-TV (Channel 4). He returned to newspapers at the Cape Cod Times two years later, then joined WPRI (Channel 12) in 1985 as the station's chief investigative reporter, a position he would hold for two decades. White's tenure at WPRI included two Emmys, one for a 1992 report on fugitive banker Joseph Mollicone and one just this year for his reporting on Providence city officials who violated the city's residency requirement. What's up with Jay Severin's timeslot on WTKK (96.9 Boston)? The Greater Media talk station now says Severin won't return to its airwaves in the afternoon until (and unless) 'TKK reaches a deal to carry the Long Island-based host's new syndicated show, which debuts in January. In the meantime, Sean Hannity continues to air from 3-6 PM on WTKK, followed - this week, anyway - by former WMAL Washington talk host Michael Graham. "They took the crosstown bus." Confused by that? So were radio listeners across the state, who heard that cryptic message one afternoon last week during an Amber Alert EAS activation from the state's emergency management office. The message was apparently part of a test that was transmitted by mistake, and it aired on numerous stations across the state. New York City's WKTU (103.5 Lake Success) is moving again. One of the four FMs displaced in the World Trade Center collapse, the Clear Channel station was the most fortunate, since it had a fully-functioning auxiliary facility at Four Times Square that was back on the air within moments. But that site is significantly lower than the rest of the market's FMs, and so Clear Channel is looking elsewhere for long-term use. 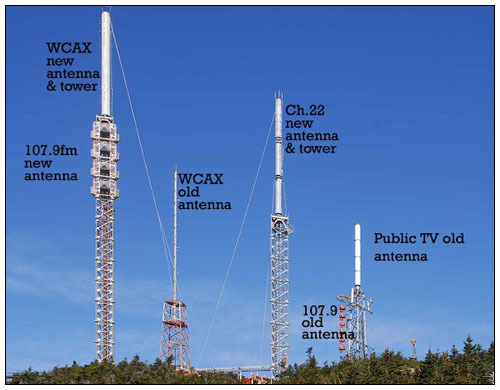 An application filed last week will move WKTU to the ERI master antenna on the Empire State Building, joining more than a dozen other FMs (including fellow WTC refugees WPAT-FM and WNYC-FM) on the city's tallest remaining structure. The engineering study (dated September 12 - they weren't wasting any time!) notes that WKTU will suffer slight additional interference from WBZO (103.1 Bay Shore) and WNNJ-FM (103.7 Newton NJ) as a result of the move, an inevitable result of the area's overstuffed FM spectrum. WNYC-FM, meanwhile, says it will cost $4 million to get back up to full power from Empire. It's looking to fellow public radio stations to help, and indeed Minnesota Public Radio has already received special permission from the FCC to do on-air fundraising to benefit WNYC, with other stations expected to follow suit. The TV DX types down that way tell NERW that the city's VHF signals are slowly getting back up to viewable power, with decent pictures being reported on channels 4, 5, 7, 9, 11 and 13 from respectable distances. We'll take care of PENNSYLVANIA next, beginning in Erie, where the new Fairview-licensed 93.9 signal is reported on the air as of today (noon on Monday, 10/15, to be exact), running active rock as WRPL, "the Planet." While Nextmedia turns on that new signal, it's transferred its 102.3 license (currently WLKK) to Regent, which began stunting this afternoon with a rotating roster of 24 different formats. The real format will premiere on 10/23 (get it? ), with new calls reportedly on the way as well. WLKK PD Tim Stephens is out as well with the demise of "the Point" there. After more than two years of promises, the Kidstar children's radio format makes its debut in Boston on Thursday, October 17, on WROR (1150 AM). The leased-time ethnic programming on WROR ended sometime Monday, and 1150 was mostly silent for much of Monday night and Tuesday, allowing Bostonians a rare chance to listen to the surprisingly good big-band format on WVNJ (1160) from Bergen County, NJ. As I write this, 1150 has returned to the air with a ticking-clock sound effect and a promotional loop that runs roughly every 20 minutes advertising Kidstar (and, unsurprisingly, no legal ID). The official kickoff of Kidstar in Boston will take place at 11:50 am on Thursday, with a celebration at Boston's Computer Museum downtown. The on-air promos on 1150 are urging kids to attend, which seems odd, given that Thursday is a school day. *It's here! As seen in the St. Paul Pioneer Press, Tower Site Calendar 2007 is now shipping!